The industrial electrical equipment industry could potentially serve up some lucrative and long-term investing opportunities. But before investors begin their search for the segment's winners, here are the basics you need to know. In a sector where leaders can achieve levels of scale that put them far ahead of peers, the industrial electrical equipment industry could potentially serve up some lucrative and long-term investing opportunities. But before investors begin their search for winners in this segment, they should understand the basics. Here is what you need to know. What is the industrial electrical equipment industry? The electrical equipment industry is typically recognized as a subsector of the manufacturing sector. The industry produces electrical products that generate, distribute, and use electrical power. Major products include electrical motors, generators, lighting fixtures, switchboard tools, switchgear, distribution transformers, industrial controls, relays, and heating, ventilation, and air-conditioning systems and components. Okken switchboard. Image Source: Shneider Electric. How big is the industrial electrical equipment industry? The electrical equipment sector has a market that exceeds $200 billion, according to a 2011 report from MarketLine. By 2016, MarketLine projects the global value of the market to reach $255 billion, growing at a compound annual growth rate of 4.7%. In the U.S., industry research company IBISWorld reported annual revenue of $47 billion in a 2014 report. Average annual revenue growth between 2009 and 2014 for the sector was 3.9%, according to IBISWorld. How does the industrial electrical equipment industry work? Given the high level of capital intensiveness most businesses in this sector have, the most common structural characteristic across the sector is high fixed costs. Which means that scale is important in the sector. Indeed, scale is becoming increasingly important to competiveness, and mergers and acquisitions are commonplace as the industry continues to consolidate further to increase economies of scale. "Acquisitions offer access to new markets and products, as well as ample cost synergies. Usually, the larger the company and the more extensive the record of buyouts, the less risk there is to investors," explains Value Line's Richard Gallagher. Further, with operating structures that characterize high fixed costs, increases or decreases in revenue growth rates can have a leveraged effect on operating results. The leverage can be magnified further by significant debt obligations. To minimize risk in investing in this sector, therefore, investors may want to look for businesses with greater scale, evidenced by operating margins between 30% and 40% and long-term debt to equity ratios below 50% (60% is about the average for the sector). Shipments, orders, and backlog are important in the industry, giving a glimpse of a company's potential to grow revenue. Rising orders will build backlog and increase sales. Lower orders, on the other hand, will hamper backlog and decrease sales. Investors in the industrial electrical equipment space should watch the trends in these metrics closely to better understand the potential of the business they are interested in. What are the drivers of the industrial electrical equipment industry? Like the manufacturing industry, economic conditions play a key role in the demand for industrial electrical equipment. When economic conditions are optimistic, customers are prone to spending more than usual on electrical equipment thanks to higher cash reserves and easier access to capital. But when economic uncertainty prevails, managers overseeing spending decisions will often delay purchases; instead of purchasing new electrical equipment, companies will attempt to repair equipment. And, unfortunately, during uncertain times, the useful life of electrical equipment can often be extended considerably if mangers insist on doing so. 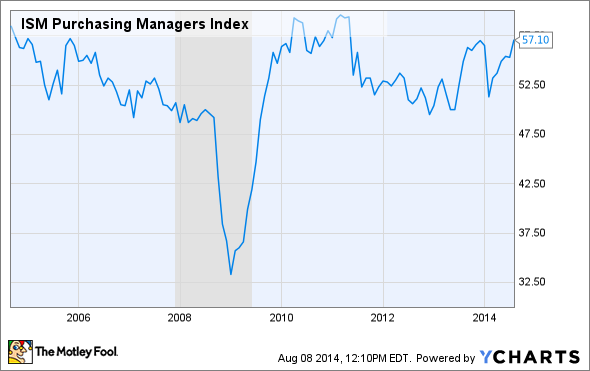 Also like the manufacturing industry, the Purchasing Managers Index is a closely watched indicator for the industrial electrical equipment industry. The index "provides a near real-time view of manufacturing production, employment levels, new orders, supplier deliveries and inventory turnover," Gallagher says. Eyeing the index allows analysts to understand whether the sector is expanding or contracting. When the index surpasses 50, the overall sector is likely expanding. Conversely, when the index drops below 50, the sector is likely contracting. Other metrics indicate potential drivers for this sector include durable goods orders released by the U.S. Census Bureau, and capacity utilization figures released by the Federal Reserve Board. When monthly durable goods orders trend upward, it's a solid indication that the economy will produce positive growth catalysts for the industrial electrical equipment sector, and vice versa when the month-to-month trend heads downward. As for the capacity utilization ratio, a rate of 80% or higher indicates that spending in the sector will rise, according to Value Line. Specific to the electrical equipment sector, companies are often highly reliant on copper, aluminum, and steel. As essential raw materials for electrical equipment, these are used in many products in this sector. Fluctuations in related commodity prices, therefore, can also affect the results of businesses in this sector.